Today, when we think about wisdom teeth, we usually think about an oral surgeon extraction or a tooth extraction. Have you ever wondered why our wisdom teeth are called wisdom teeth? When they emerge, do we suddenly gain tremendous amounts of wisdom? Will we suddenly understand the meaning of life? Well, not exactly. The third molars or “wisdom teeth” were thought to erupt later in life, between the ages of 17-25, ending the adolescence stage and ushering in the “wisdom” of the adult years. While our wisdom teeth might not usher in the maturity of adulthood, they may usher in the pains of adulthood. 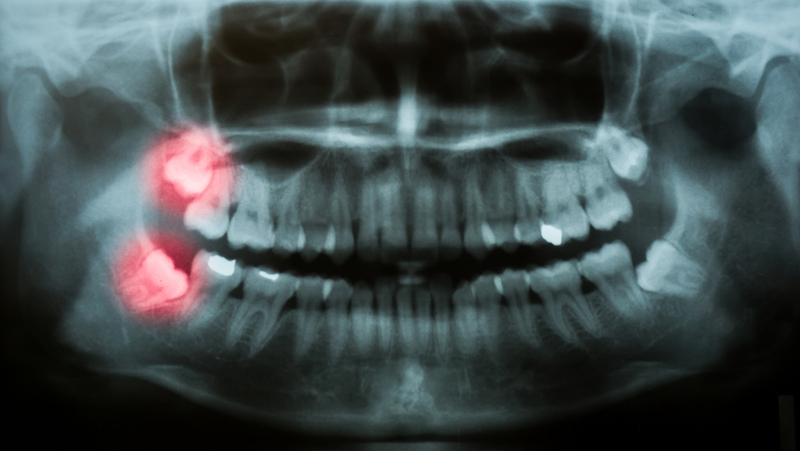 Around 85% of people have their wisdom teeth removed at some point in their life. That’s millions of people each year! Not everyone requires an oral surgeon extraction of their wisdom teeth, but if you experience any of these symptoms, it’s best to see your dentist to discuss your options. Pain and Discomfort – Sometimes wisdom teeth can become impacted, causing some discomfort and pain in the jaw. However, because wisdom teeth are located in the back of the jaw and under the nasal passages, you may experience sinus discomfort, earaches, shoulder and neck pain, headaches, difficulty opening your mouth, and facial pain. Swelling – Discomfort is common when a new tooth erupts, but an impacted wisdom tooth can cause swelling in other areas. If you experience swelling in your sinuses, face, around the jaw, or glands in your neck and shoulder, it could be time for your wisdom teeth got an eviction notice. Foul Smelling Breath – Sometimes there is not enough room for wisdom teeth to grow when they begin coming in. This can cause issues like overcrowding, which can then create crevices for bacteria to grow or create pockets that are hard to clean. If your hygiene routine is thorough, and you’re still experiencing persistent bad breath, a bad taste in your mouth, or discovering food particles after you’ve brushed your teeth, it might be time to see how these teeth are affecting your overall oral health. If you experience any of the above issues, then it would be beneficial to you and your smile to contact Penn Dental Medicine and see how you can become a patient to receive an oral surgeon extraction. 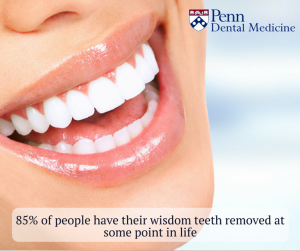 At Penn Dental Medicine, let us help you usher in your years of wisdom with a happy and healthy smile. Oral surgery doesn’t have to be a scary experience. If you’re worried about scheduling your upcoming surgery, let us help calm your nerves. Call us at 215-898-8965 if you have any questions. We are here to help you!